Definition - What does Agnistambhasana mean? From a simple cross-legged position, the shins are stacked on top of one another by placing the left ankle on top of the right knee, then sliding the right foot forward until it is underneath the left knee. With a flat back, the upper body folds forward to deepen the stretch. This is repeated on the second side for balance. 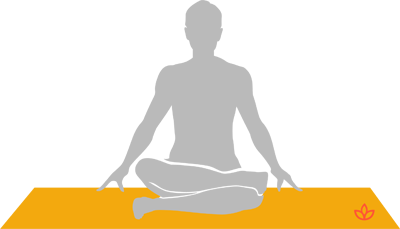 Agnistambhasana is also known in English as fire log pose, double pigeon pose or burning log pose. Traditionally, agnistambhasana is believed to open the muladhara (root) chakra. Opening this chakra provides mental and emotional grounding, thus increasing the individual's sense of security and peace. Beginners or those with limited flexibility can sit with a rolled blanket, yoga blocks or a cushion under the buttocks. If the pose is still too difficult, it's a good idea to start with baddha konasana (bound angle pose) and supta baddha konasana (reclining bound angle pose) to gain flexibility in the hips before attempting agnistambhasana.